This delightfully fizzy ferment is a tasty way to make your own probiotic, healthy ‘soda’. Although a very small amount of alcohol is created during fermentation, this is a non-alcoholic ‘beer’ and can be served to kids. To make ginger beer, we first make a fermented ginger bug which is a magical process! Ginger bugs are created by feeding sugar to the natural bacteria present on the ginger root and in the air of your kitchen. The ginger bug is then added to a sweet ginger tea where it will ferment the sugars to create our fizzy brew. There’s so many fun variations you can play with. Turmeric root can be added to your ginger bug and any number of berries and fruits can be added to your ginger beer. I love Strawberry Lime in the spring and Turmeric Passionfruit in the winter. 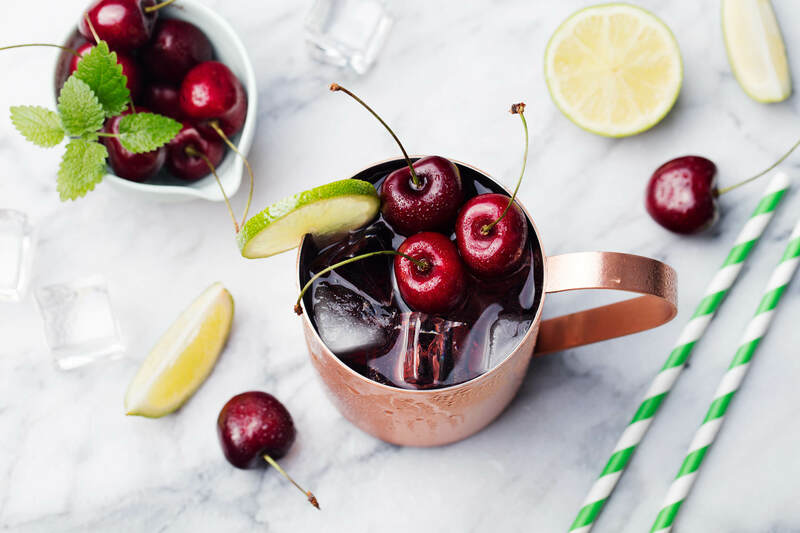 In this recipe, sweet cherries and fresh lemon combine to make a beautiful and tasty brew. 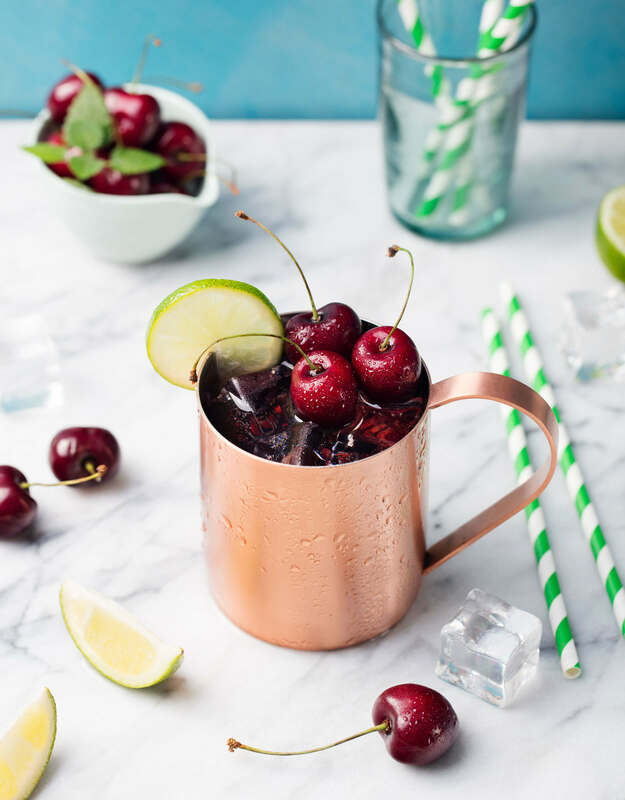 Cheers to Cherry Lemon Ginger Beer! Prepare ginger bug: In a glass jar, add 1 cup filtered water and 1 tbsp each ginger and sugar and stir to combine. Cover jar with a sheet of paper towel or a clean cloth and secure with a rubber band. Let ferment in a warm place away from direct sunlight for 24 hours. After 24 hours, stir in another 1 Tbsp each grated ginger and sugar and let ferment for another 24 hours. Repeat again each day until your bug is bubbly when you stir it. The bubbles are an indicator of an active ferment. Depending on the temperature of your house, this can take 2-7 days. Once your ginger bug is bubbly, you’re ready to make ginger beer! To make ginger beer: Place pitted and chopped cherries in a bowl and stir in 1/3 cup sugar. Cover with a towel and set aside. Meanwhile, in a saucepan, bring 5 cups filtered water to a boil. Add 4 tbsp grated ginger and remove from heat. Stir in 2/3 cup sugar until dissolved. Cover and let steep for about 30 minutes. Then strain into a large bowl using a fine-mesh sieve and allow to cool to room temperature. Once the strained ginger is room temperature, proceed with cherries. Add them and 1 cup water to a blender or food processor and blend. Strain cherry mixture with fine-mesh sieve into the strained ginger bowl, pressing on solids with a spatula to extract as much liquid as possible. Add the fresh lemon juice. Using sieve, strain your ginger bug into ginger cherry mixture and stir to combine. Pour into sanitized bottles, leaving 1-inch of headspace at the top. Seal tightly and set aside in a warm place, out of direct sunlight, for 2-5 days. As your ginger beer ferments the sugar, you will create a fizzy drink. Remember that this is building pressure inside the glass bottles though. Make sure to test your beer daily, by slowly opening one of the bottles and checking for fizziness. If it’s not fizzy yet, reseal and allow to ferment another 24 hours. Once you test and find a fizzy brew, reseal and transfer all of the remaining bottles to the fridge for storage. Consume within 30 days. Did you try this recipe? Leave your feedback in the comments below!